jonnyontheroad: Sports Day - For Teachers! Sports Day - For Teachers! Yesterday, after a special lunch of boiled pork, kwamegi, and a lot of alcohol, the teachers congregated in the gym for an afternoon of games and friendly - sometimes heated - competition. 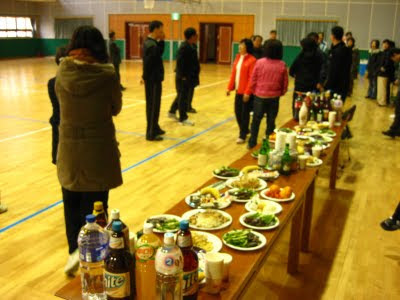 All of the food and alcohol from the cafeteria had been moved with us, and by the time the games were finished, the table had been decimated. Especially the alcohol. The event kicked off with an easy warmup: some jumping jacks, ab twists, and massage trains. The first game was one I will call "The Run & Tumble". It was a relay race of 10 people, in which each person had to spin around 5 times, run to the end of the gym, turn around and run back, tumbling over a mat halfway through the return leg. In the first race I competed against the school principal, which I only realized after the fact. I beat him handily, which was not unexpected considering he is 60+ years old, thin as a rail, and was probably quite drunk. The third game was the shoe toss, similar to bocce, where teachers tried to flip their shoes or sandals about 15 yards into - or near - a bucket. The winners received prizes, and though I didn't win I was given one anyway - two tubes of toothpaste. 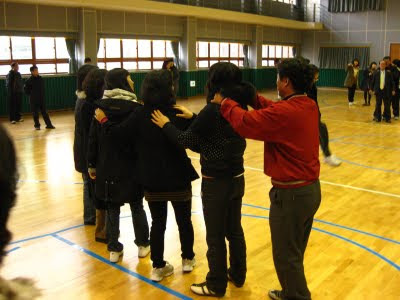 The final game, which attracted the most fervor and excitement, was yutnori, a traditional Korean game in which split sticks are tossed onto a mat. Points are awarded depending on the combination of sticks up or down, and markers are moved along a game board. Though I quickly caught on to the point value of stick combinations, the movement of the markers was quite confusing to me, and apparently to my co-teachers as well. It was a constant source of disagreement, which Mr. Lee said makes the game more fun. "When we have disagreements we come together afterward and feel good." Before we left there was a raffle. While Mrs. Lee was trying to explain the tile movement of yutnori to me, there were screams in English. "You won!" I marched to the front to accept my prize: two pairs of socks! Yutnori - seems like a more than random game frought with opportunity for argument. As designed. But it does put our US schools to shame; the teachers seem to be well versed in entertaining themselves. And COLD? Whats with all the coats and winter wear inside?